Have you been keeping your micro-mining on to acquire more IOTW TestNet coins? If yes, good job! If not, you should and here’s why. From now on, you can start purchasing t-shirts, laptop stickers, and later, IOTW smart light bulbs, IOTW power plugs and real IOTW tokens using TestNet coins in your wallet application. Given the large community and demand, each wallet user can only purchase one unit of each product. An exception to this rule is the stickers; each person can purchase up to three units. Orders and merchandise will be sent to your shipping address. We’re also launching a referral program for our TestNet, where IOTW is rewarding 100 coins per referral to users who refer a friend–their referral–to sign up for the TestNet. 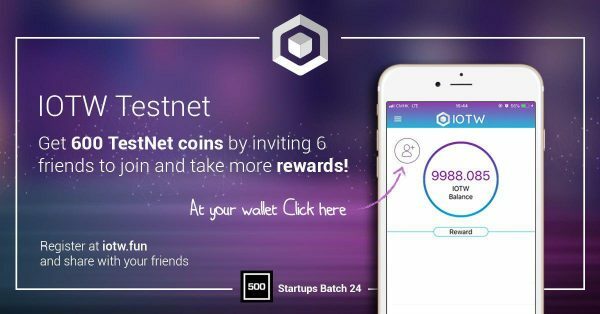 Each existing user can invite up to six friends and earn up to 600 free TestNet coins. Additionally, each new referral receives 20 free TestNet coins for accepting the invitation to try the TestNet out. Ask them to follow signup steps at https://iotw.fun/ and start micro-mining!